It's a fine day for Alex as he passes his driving test today at Beeston test centre here in sunny Nottingham. A very convincing performance with only the one driving fault. He's away to university on Saturday so it's a relief that he's got his licence sorted before he goes and can now use it for ID in clubs and bars. It's been a two part journey for Alex. 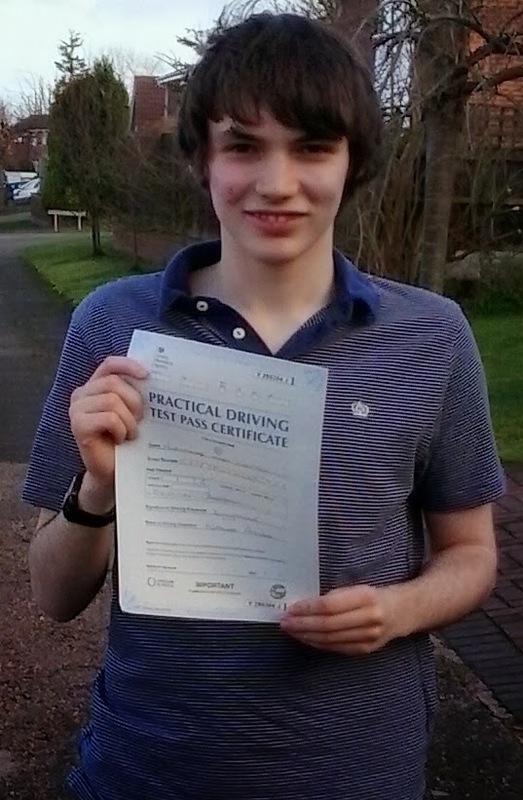 Having learned with me from scratch earlier in the year up to taking his test at the Colwick test centre. He was a good driver then but the weather on the test day was really bad. Heavy rain makes it difficult to use the mirrors during manoeuvres and Alex fell foul of this. Striking the kerb on a left hand reverse. After a break for school commitments he returned and had some refresher lessons over the Christmas period and improved his driving skills even further. Hazard awareness and forward planning were developed to a higher standard around the busy areas of Nottingham leading to today's success. Well done Alex. It's been a pleasure and I wish you all the best for the future! There are now books and notes about driving instruction that will help those beginners to learn easily.